Except for a few very worthwhile diversions, this tour follows beautiful Highway 89 all the way from the shadow of 14,000′ Mount Shasta to the south shore of Lake Tahoe and beyond, into the high Sierra. Along the way it visits Burney Falls, Lassen Volcanic National Park, Lake Almanor, and many other, less well-known scenic jewels. Or you can make use of our alternate start venue in McArthur, which exchanges Mount Shasta and some of the early Hwy 89 miles for quiet back roads in the beautiful Fall River Valley. In addition to the marquee sights listed above, expect miles of quiet roads through the tall trees, high-mountain meadows, tumbling streams and waterfalls, alpine lakes, and the occasional serene river valley (such as Indian Valley, pictured at left). Explore a cave on Day 2, steaming geysers and fumaroles—as well as year ’round snow fields—on Day 3, or a fascinating railroad museum on Day 5. This tour can be modified to make use of indoor overnights. I would take a little doing, but it’s possible. Begin with a long, very gradual climb to Snowmans Hill summit on Hwy 89. 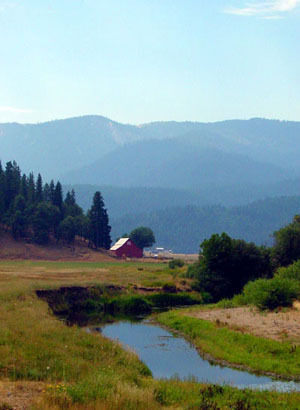 After the long descent, visit the picturesque town of McCloud and later the impressive waterfalls along the McCloud River (slightly off the route). The short route stays on Hwy 89 until it meanders off on a peaceful back road loop on Clark Creek Road. The longer route leaves 89 for a detour through the Fall River Valley…a long diversion, but mostly easy miles on dreamy roads through the middle of nowhere. Camp at McArthur-Burney Falls State Park and visit magnificent Burney Falls. Showers. There are two hotels in the nearby town of Fall River Mills, and the routes can be made to pass by them. For those wishing to avoid the heavier traffic on Hwy 89, this alternate stage combines most of the best parts of Day 1’s long and short options into one easy and highly rewarding loop around the Pit River and Fall River Valleys, a delightful back road trek on Clark Creek (including a visit to Burney Falls and an optional run along the banks of the Pit River), and finally a moderately hilly journey back to Fall River Valley. Overnight at Intermountain Fairgrounds in McArthur. (Note: we started from Shasta the first time we did this tour, but did this alternate first day the second time we toured here. Having done them both, we prefer this stage.) See note above about hotels in Fall River Mills. Begin with a hilly run along the ridge line above the Pit River, then follow a long, gradually uphill run along pretty Hat Creek. Stop at the mid-way point to explore a cool, dark lava tube cave near the town of Old Station. After that, the climbing becomes a little more challenging—although never brutal—on the way up and into Lassen National Park. After a fun, 3-mile descent in the park, finish up with an 8-mile climb to Summit Lakes Campground amid Lassen’s spectacular alpine scenery. No showers, but lake access. Staying indoors this night is the biggest challenge. You would have to ride all the way through the park and down to the town of Mineral. It makes for a long day, although the final 20 or so miles are all downhill. One of the all-time great bike rides! Begin by climbing (always gently) to the 8500′ summit on the shoulder of Lassen Peak..probably riding through snowfields at the top of the climb. Then dig into one of the best descents ever: 12 miles of switch-backing, cork-screwing craziness (15 miles on the longer route). The longer route detours through the town of Mineral and adds the superb Hwy 172: easy climb and ripper descent. Both routes continue on Hwy 89 to Lake Almanor and a private resort on the east side of the lake. Showers and swimming in the lake. There are also many inns and resorts at the lake. After leaving Lake Almanor, scoot downhill on a 6-mile flier into a pleasant valley near the town of Greenville. Leave 89 and meander along the edge of the valley on tiny, sleepy lanes before more downhill alongside the white water rapids of Indian Creek. Climb along Spanish Creek, bypass the town of Quincy on another quiet byway, and then finish up with a long, rolling run up to a private resort just before the town of Portola. Showers and swimming pool and all conveniences. Plenty of motels in Portola. A challenging day, especially on the longer route. Heads into Portola for a visit to the sprawling railroad museum, then descends back to Hwy 89 on a slinky downhill. The short route heads south on 89, while the long route loops up and over Gold Lake Forest Highway: a long climb, great vistas from the summit, and a wild descent..followed by another long, easy climb to Yuba Pass and an even wilder descent back to the short route on Hwy 89. Together, the routes pass through the quaint town of Sierraville, then climb up and over several significant ridges to the finish at very pleasant Alder Creek Camp, north of Truckee. There is a second short option with less climbing. Showers. (Note: of the two shorter routes, the flatter one is probably the better option.) Truckee is motel city. After dodging around the busier parts of Truckee on rural-residential side streets, the short route follows the Truckee River to the north end of Lake Tahoe, while the longer, hillier route heads to the lake over Brockway summit. Both routes travel down the western shore of the lake on a nearly level, shoreline run (still Hwy 89). Near the southwest corner of the lake, the road climbs up and over the rocky headlands that make up Sugarpine, D. L. Bliss, and Emerald Bay State Parks—one of the most beautiful stretches of road around—before descending to the tour’s conclusion at a private resort on the south shore of the lake. Optional out-&-back—highly recommended—to the top of Donner Pass offers great vistas over Donner Lake. Showers and all conveniences. Plenty of motels near the lake. Sneaks around the clutter of South Lake Tahoe on obscure back roads, then climbs over magnificent Luther and Carson Passes before wrapping up the tour with a wild, 25-mile descent along Mormon Emigrant Trail to a regional park on the shore of Jenkinson Lake, in the foothills of the Gold Country. Overnight camping available (no showers) or just hop in the lake, have a picnic lunch, and head for home. 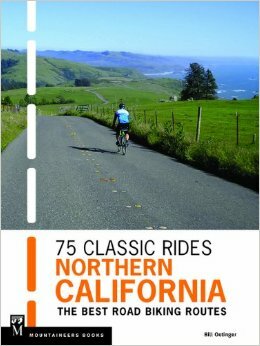 Although the “official” Northern Peaks Tour ends in the Gold Country, this packet also includes maps and detailed information on two more days of riding that can be used to link this tour to the Three Parks Tour (that runs through the southern Sierra, visiting Yosemite, Kings Canyon, and Sequoia National Parks). Together, the two tours make up an epic, two-week odyssey down the entire mountainous backbone of the state of California. Or you can just tack these two great days of riding onto the end of this tour.